Explanation: Have you ever seen a gigantic jet? They are extremely rare but tremendously powerful. Gigantic jets are a newly discovered type of lightning discharge between some thunderstorms and the Earth's ionosphere high above them. 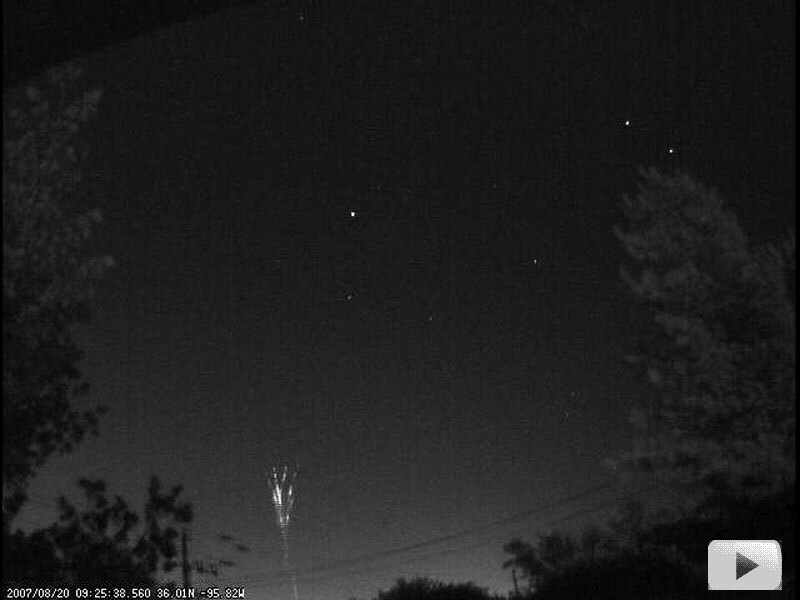 Pictured above is one such jet caught by accident by a meteor camera in Oklahoma, USA. The gigantic jet, at the lower left, traversed perhaps 70 kilometers in just under one second. Clicking on the image will bring up a movie in many browsers, also visible here. Gigantic jets are much different from regular cloud-to-cloud and cloud-to-ground lightning. The bottoms of gigantic jets appear similar in appearance to another type cloud-to-ionosphere strike called blue jets, while the tops appear similar to upper-atmosphere red sprites. Although the mechanism and trigger that causes gigantic jets is a topic of research, it is clear that the jets reduce charge imbalance between different parts of Earth's atmosphere. A good way to look for gigantic jets is to watch a powerful but distant thunderstorm from a clear location.